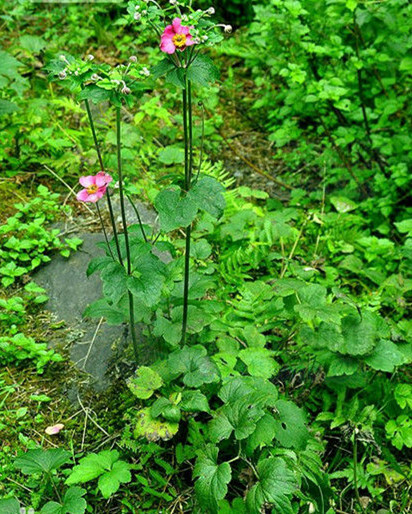 The drug is the dried or fresh entire herb of Anemone hupehensis Lem. (family Ranunculace), growing in low mountains, hilly grasslands or creeky bands; and distributed in shaanxi, Zhejiang, Jiangxi, Hubei, Guangdong, Guangxi, Sichuan, Guizhou and Yunnan of China. Bitter, pungent, neutral, slightly toxic; spleen, stomach and large intestine meridians entered. Expel parasites in the intestines, resolve swelling, dissipate blood stasis, treat infantile malnutrition. Malaria, dysentery, sores and boils, traumatic injury, scrofula, infantile malnutrition, favus of te scalp, stubborn dermatitis. Decoct 3~9 g, or pounded into powder or soaked in wine. Proper dosage is for external application, pounded for applying or decocted for washing. It is contraindicated to pregnant women, people with nephritis and renal insufficiency.